This joint study by the OECD Development Centre and the Institut supérieur des sciences de la population (ISSP) is based on four years of fieldwork and data collection among 2 200 households in Burkina Faso. 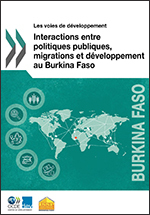 It analyses the effects of migration on the key components of public policy in Burkina Faso and the influence of sectoral policies on migration. Burkinabe emigrants account for between 8-10% of the country’s population (about 90% live in Côte d’Ivoire) and remittances in 2015 amounted to 4% of GDP, up from 1% in 2009. If the funds sent by migrants contribute to the development of the country, subsidies paid to agricultural households do not reduce migration outflows. The study concludes that they must merge the objectives of migration policies with those of other sectors in order to make them truly effective.